An official survey was delivered to us earlier this month. While there were no surprises, we do have a few concerns about the feasibility of siting a home on this property. To catch you up on a little history of the land: the nine acres under contract was once a ten acre parcel. 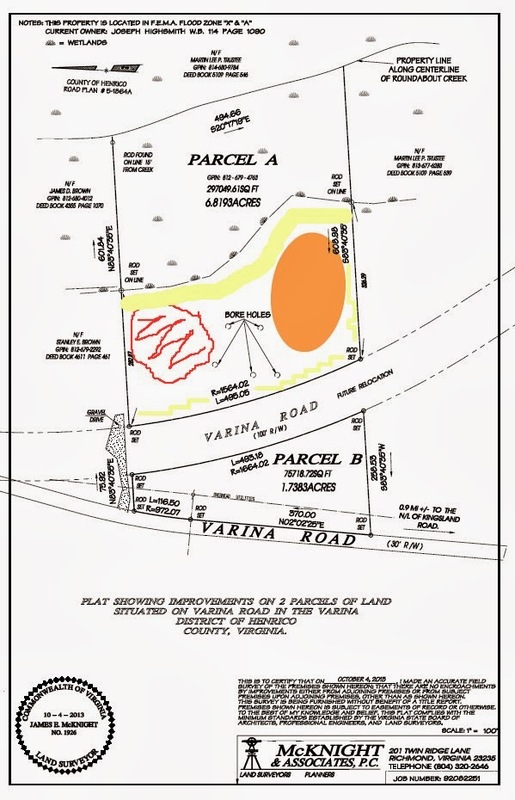 In the 1970's Henrico County purchased from the then-owner 1.3 acres in order to widen Varina road as part of a larger infrastructure renovation. We were made aware of the land acquisition in very vague terms a couple months ago, but without an official survey there really wasn't much to go on. After some investigating, we were told that the road project had been abandoned, which was a promising bit of information, and so we initiated an inquiry process to buy back the Henrico-owned acreage in order to reconstitute the parcel. While we are theoretically set to close in November, it could be another 3-4 months before the County has a final decision and purchase price to share with us. In fact, they could come back and say that they DO intend to use the land for some future purpose, which would likely convince us to move on in our land search. From the survey, you can see that the back third of the property has been identified as protected wetland. You can also see the strip of land currently owned by Henrico County (approximately 1.5 acres) running through the front third of the property (marked by Varina Road, future relocation). I have highlighted in yellow (not to scale) the required setbacks--or the minimum distance from which we will be allowed to build any structures--for the relevant property lines and wetland designations. Add to that the chunk of land identified for an alternative septic system (bore holes) and the back-up location in case the first system fails years down the road (red circle with squiggles), and you can see how constrained this nine acres appears for building! I've drawn an orange shaded oval to represent the roughly 1.5 acres of buildable land. Of course, 1.5 acres is plenty of space to build a home, but the uncertainty of the Henrico land weighs heavy. If we can acquire it then our worries are mostly moot but, in the meantime, we wonder if the seller will be open to waiting out the County's process with us. Our next steps include investigating more specifically the requirements for protecting the wetland (we think it is a 100ft. setback) and identifying the 100 year floodplain, which could pose more building restrictions! We will be meeting with an architect in early November to consider a professional opinion about our options to site the house on the land, with and without the assumption that we own the Henrico acreage. THEN, we need to check-in with the county on the progress of our buy-back inquiry and hope they've made some progress before we call a face-to-face meeting with the seller and his Realtor to discuss where to go from there. So far, this land buying experience has been about on par with what we expected: exciting, time consuming, complicated, and slooow.